Today, September 4, 2018, Viikki, the world's most eco-friendly bulk carrier, has been delivered to Aspo Group's ESL Shipping from the Jinling shipyard in Nanjing, China. Viikki's sister ship Haaga was delivered on August 20. The 160-meter, LNG-fueled vessel of 25,600 dwt emits over 50 percent less carbon dioxide than the previous generation of vessels. "Viikki and Haaga significantly reduce emissions from our customers' transportation chains, and this new vessel category increases the flexibility of deliveries. We are proud that this innovative and energy-efficient vessel sails under the Finnish flag", says Mikki Koskinen, Managing Director of ESL Shipping. Like its sister ship Haaga, Viikki will first head from the shipyard to Japan, from where it will arrive fully laden at the Baltic Sea approximately at the end of October. 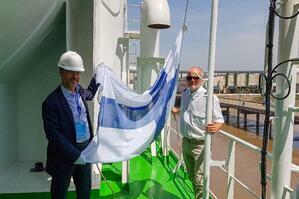 The plan is that both vessels will travel to the Baltic Sea via the Northern Sea Route. This shortens the travel time by nearly three weeks compared to the route via the Panama Canal and, therefore, significantly reduces the environmental impact of the trip. The use of the Northern Sea Route reduces emissions by more than 40 percent compared with going through the Panama Canal. The Northern Sea Route can only be used for roughly two months in early fall when it is free of ice. "These new, next-generation vessels are a good example of how Aspo as a responsible owner is aiming to help mitigate climate change. Their passage via the Northern Sea Route is a concrete indication of the impact of climate change - but also of new business opportunities. 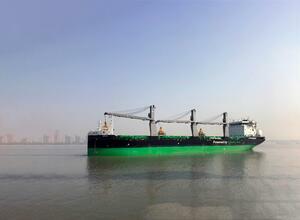 Only a handful of merchant vessels traveling the world's seas are ice-strengthened. All 50 ESL Shipping vessels are heavily ice-strengthened. What is more, we have excellent special expertise in operating in the arctic", says Aki Ojanen, CEO of Aspo Plc and Chairman of the Board of Directors of ESL Shipping. 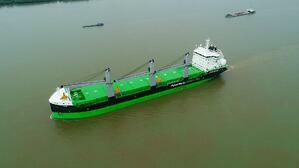 Read more about the new vessels on ESL Shipping's special site here. Click images to download them in original size. 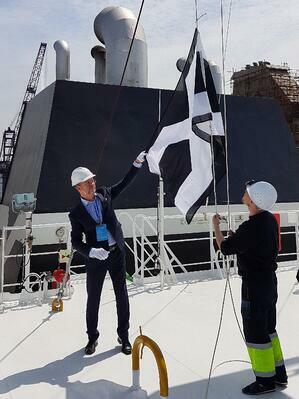 Managing Director Mikki Koskinen and Chief Officer Timo Kosunen hoisting the company flag.